On Saturday my brother Anthony and his wife took me to the Fox and Hound restaurant in Hubertus, Wisconsin. I was amazed by the amazing collection of Tramp Art frames from Germany. 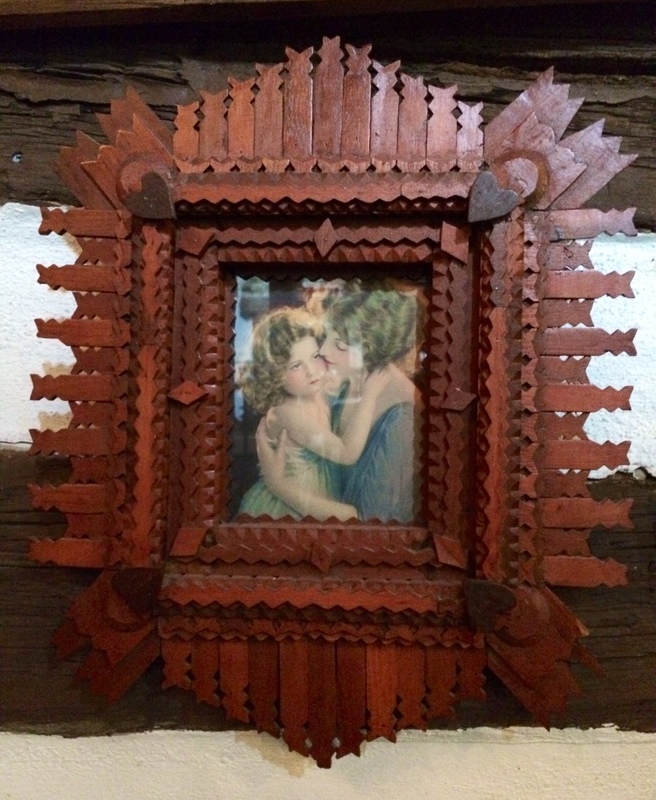 These intricate hand carved wooden frames were popular in the US in the 1860’s. The restaurant began as in 1845 as a one room cabin on the Moraine in the SE of the state. The frames were brought here from Bavaria by the second owner in 1930. 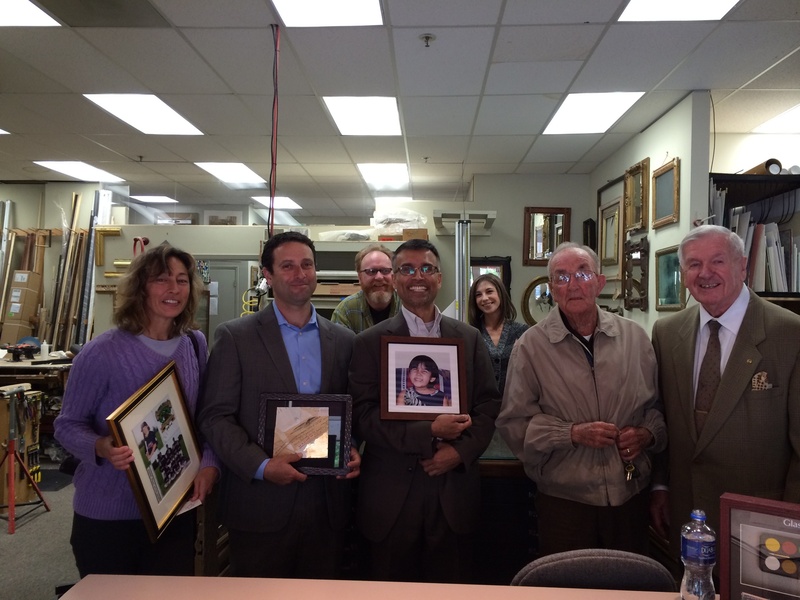 Ruth Stroup’s friend Steve Nicholls of Nicholls Construction gave her some treasures from his in- laws attic. Packets of needles from the 1930’s made in West Germany. They are for “home, farm and camping”. You darn your sox while camping, right? Ruth asked me to frame them. I recalled I had a hand painted 1920’s frame with tiny cast flowers adorned with bronze powder. It has the original convex glass. I had been saving it for 10 years and this was the perfect opportunity to pass it on to my pal Ruth. Since we had two packets of needles I could show the inside and outside of the folder side by side. These pristine examples of promo history are mounted on a blue silk backing. You can’t see but the back is sealed with hand made red paper. 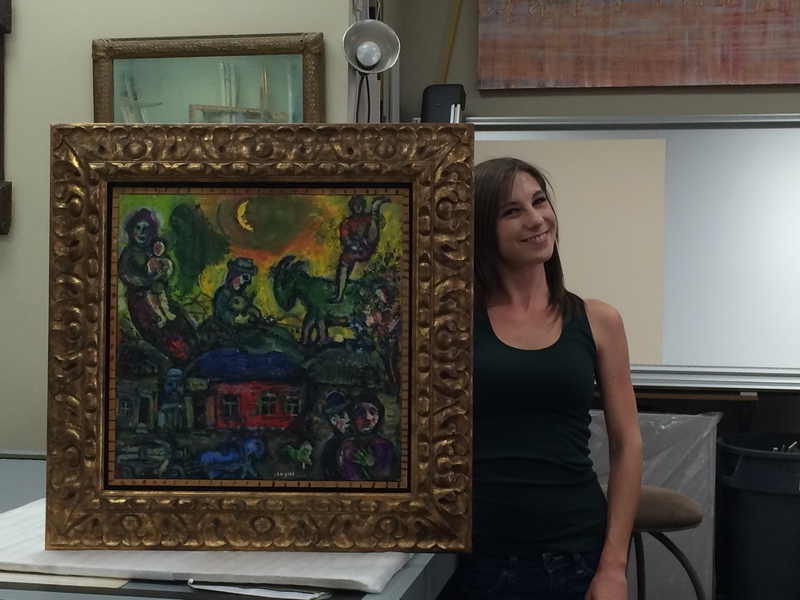 Chagall and Morgan, the framer. Paysage sous la Lune was painted in 1964 by Marc Chagall. It is oil on panel. Chagall is famous for dazzling color and taking us on flights through his inner world. He said, “I paint with my heart.”. When you look at his creations you are seeing his psychic reality. 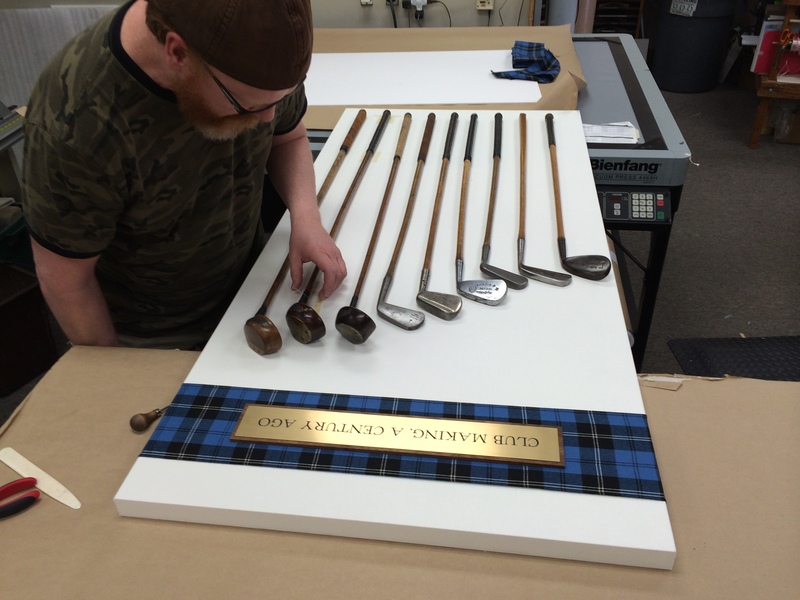 John hand sews antique golf clubs to a linen backing. Lars took a break from the IRS deadline for a photo in his Alameda office. He is the generous sponsor of my presentation on framing set for June 11, from 6:00 to 9:00 at the Frank Betts Center for the Arts in Alameda. June 11, 7-9pm • Elida Scola speaks on the history of framing art, framing challenges and how to determine what frames are suitable for different art styles and periods. 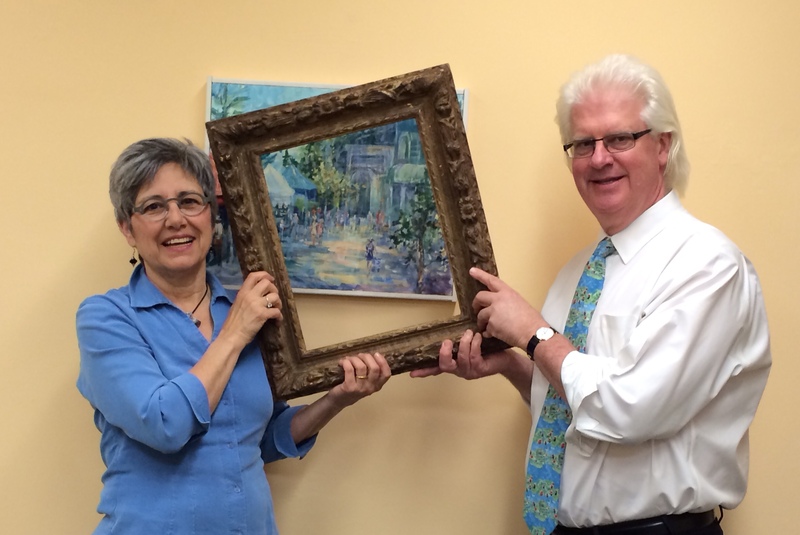 She helps her clients understand how framing affects their art. This talk is part of a six part series of lectures on Art History & Art Appreciation designed to help people learn about art forms, and improve their appreciation and collection skills. 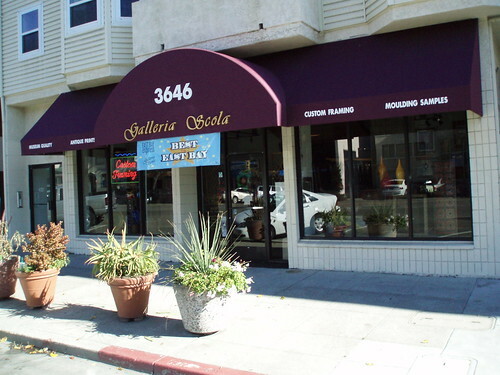 It is one of the few opportunities to study Art History, outside of academic classes, offered in the East Bay.The presentations will be in an intimate atmosphere to encourage interaction with the speaker. Reservations recommended as space is very limited. To make a reservation contact the Bette Center or e-mail nan.gray@yahoo.com. Non-members $10, Frank Bette Center members $5 each lecture. Sponsored by tax and business accountant Lars Hansson, CPA, Alameda.